Last Tuesday Sean Murray tweeted a pic of the Hello Games staff hard at work on the first update for No Man's Sky, and yesterday he dropped all the details that are included in that update. Now you may be thinking that day zero patches are nothing new for the gaming industry, but there are some interesting circumstances to consider here. As it goes sometimes, some retailers inadvertently broke street date on the PS4 version of the game and a few lucky gamers have been streaming the daylights out of the game a couple weeks before it's supposed to be in the wild. These streams revealed that the gold version code printed to those discs was somewhat...wanting. 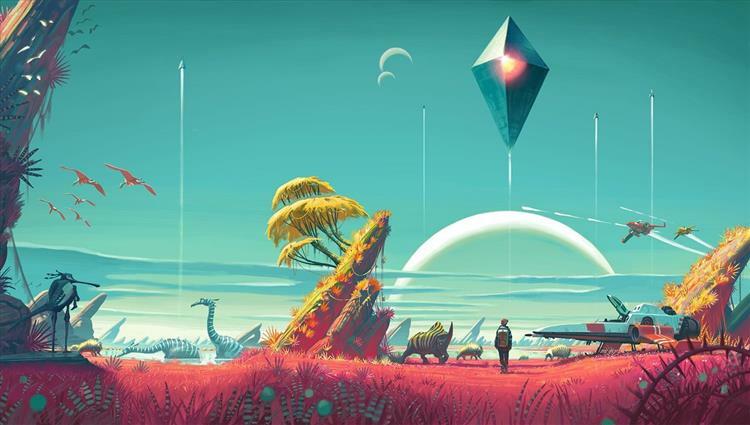 Collision issues, game-breaking bugs, persistent crashes, sea life swimming on land, and some exploits that let players reach the center of the galaxy is less than a week were all evident in the streams. Needless to say these rather troubling issues set the fanbase ill at ease. A week ago, No Man's Sky was looking pretty broken. Thankfully, in the patch notes Sean Murray addresses most of these problems and also details some of the content his team is adding. Because this update fixes so many bugs, patches out huge exploits, moves entire star systems around and makes galaxies up to ten times bigger, any *ahem* pre-release owners will have to delete their save and start over to see these updates go into effect. I'm still mildly skeptical about this game, as even after five years of development Sean Murray and his team are clearly scrambling to get it ready for its delayed August 9th 12th release. That said, if everything he discusses in the patch notes are true...Friday will be a day to remember. You can read about the day zero update here.